I can’t speak to you. Don’t you know I have cream on my face?" she told a young journalist witheringly over the phone. The next week the scribe was happily wolfing down lemon tarts and coffee at Delhi’s India International Centre for a long convivial chat with Amita Malik. There’re not many people who make their life an event but Amita Malik who passed away last week at the age of 88, managed to do just that. Mrs M would have revelled in the fact that Slumdog Millionaire had received eight Oscars and earned tonnes of international accolades. Ever since she started her column for The Statesman, Film Notebook, way back in the mid-1950s, she always believed passionately that Indian films, especially regional films, could hold their own on the international stage. That is why she took great offence when Nargis Dutt, then a member of Rajya Sabha, said that Satyajit Ray only publicised India’s poverty in his films. As a film critic, and as a Bengali, Mrs M wrote in great detail why she thought this assessment was completely off the mark. At a time when writing on films was not a mainstream journalistic activity — Mrs M single-handedly placed it on the map. Indeed, she opened the window in India to the concept of film studies. Old timers recall how she would come to file her copy accompanied by a series of her pet dogs. As she diligently wrote, at any given time her dog would be patiently waiting in the reporters’ room leashed to a chair leg. It’s hard not to overstate Mrs M’s contribution. She interviewed the legends of cinema, including David Lean, Ellia Kazan, Marlon Brando, `A0Satyajit Ray even managing to interview the reclusive Ingmar Bergman — with ease. 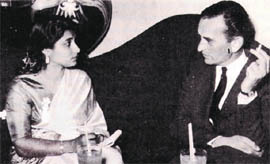 Her association with Ismail Merchant was so close that while on a trip to Mumbai he admitted to a friend that he dared not visit Delhi as he had forgotten Mrs M’s favourite brand of bright red lipstick and will not be able to replenish her stock. From films Mrs M expanded her canvas and began to comment, under a pseudonym, on radio and later on television through a column entitled Sight and Sound at a time when Doordarshan was becoming a national network. Quick to point out potential talent, her praise or criticism was enough to break or make careers. Especially scornful of the English news readers whose pronunciation was not up to the mark, she once devoted an entire column on the difference between the ‘V’ and the ‘W’ sounds. At different points of her life she wrote in The Statesman, The Times of India, The Indian Express, Hindustan Times and more recently The Pioneer and The Tribune. But her professional commitments formed only one dimension of Mrs M’s personality. She was passionate about driving, learning to negotiate mountainous terrains when she lived in Shillong as a young adult. Later, this expertise made her take part in many car rallies and also enabled her to drive frequently on her own from Delhi to Simla where she was writing her second book, Amita, No Holds Barred, at the Institute of Advanced Studies. In fact, she was driving till two years ago when she was forced to hire a driver only on the insistence of some concerned friends. A great fan of the western classical music, she always wanted to be a pianist and artlessly admitted to a friend that she should have married a rich man who would have been able to afford a piano. A talented cook, she was forever wanting to eat out or was feeding young colleagues who were introduced to complicated Bengali dishes like fish head curry at riveting adda sessions held first at her Defence Colony barsati and then in a bungalow in Kaka Nagar where she lived for years. Self-admittedly indulgent, she regularly went to have her hair styled at Delhi’s Oberoi hotel. Her sartorial sense was just as distinctive: She loved admitting to a younger colleague that she owned a Balacengia coat much like the one worn by Audrey Hepburn in Breakfast at Tiffany’s. Till last year she could be seen in the Capital’s Khan Market nattily dressed in stretch pants, eyes rakishly outlined with liner, her bright red lipstick still in tact. Typically, Mrs M didn’t pass away because of a prolonged illness. The end, when it came, was short. She was writing her columns till about a month ago and in one of her last columns she said, "Dear viewers, a Happy New Year not only in happiness but in good health and peace of mind in these troubled times." It was almost a final blessing. Mrs M, you will be deeply missed but not forgotten.